Salt Lake Comic Con FanX wrapped up yesterday and what an incredible time we had! I was nervous about balancing my schedule with this also being the closing weekend of the Sundance Film Festival, but after my FanX experience I'm so glad that I did! Unfortunately, I did miss part of Thursday's coverage and miss out on being a part of the Supernatural panel. I was so bummed that I had to miss any of FanX, but I had to finish a few screenings and interviews at Sundance. 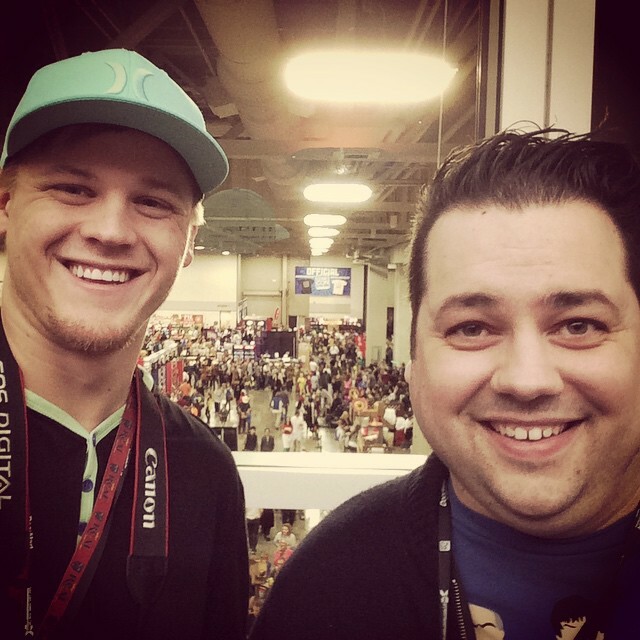 As usual the guest lineup for Salt Lake Comic Con FanX did not disappoint! The part of Thursday that I did get to experience was the awesome press conference at the Grand America Hotel featuring many of the great celebrity guests that would be attending Comic Con. Chris Provost welcomes the crowd with his usual Laughy-Taffy jokes. Dan Farr and Bryan Brandenburg take the stage to welcome the press and cosplayers to the press conference. Salt Lake Mayor, Ralph Becker takes the stage to declare the day "Salt Lake Comic Con Day". The guest introductions began that are always a lot of fun. Nichelle Nichols from 'Star Trek' kept us all laughing as she continued to step up between ever few guests to remind us to "Live Long and Prosper". Nichelle Nichols from 'Star Trek'. Mark Pelligrino from 'Supernatural' greeting the fans in Salt Lake City. Mark Pelligrino arm-wrestling with members of the Press. He made everybody's experience with him personal and a lot of fun. Friday started off fairly early for me as I had a panel at 11:30 for 'The Best of Doctor Who'. I was absolutely honored to be a part of a Doctor Who fan panel. Especially in a year where we had a Doctor and two companions in attendance. My view of our Doctor Who crowd. Thank you to all that attended! Following the Doctor Who panel I hit the convention floor to see what was new this year and to see which of the guest were out on the floor. The first guest we encountered was Anthony Michael Hall signing and talking to fans. The cosplay was fun as always at Salt Lake Comic Con. I didn't get to see as much as I would like since I was running from panel to panel, but here were a few that we were able to see. The DeLorean from 'Back to the Future' was back. Why a picture of the sign you ask? Well, they wanted to charge us $15 to take a picture of the car. So enjoy the sign of the booth! As you saw from my FanX post, I always love to see the 'Lord of the Rings' trolls and they once again made their return! The trolls are always a fan favorite to take pictures with and pretend the be getting stepped on. We always love seeing the cool Lego displays at Comic Con. Here is a look at some of the Lego displays on the floor. After checking out the convention floor we left to attend more panels for the day. The lines were getting long as many fans began to anticipate the arrival of Tom Felton from the Harry Potter films. When Tom's golf cart rolled around to his panel screams erupted for the Harry Potter star. Tom Felton was an absolute delight during his panel! I look forward to the potential of future Harry Potter guests. Following Tom Felton's panel, we spent a little bit more time out on the floor seeing what the convention had to offer. Austin and I taking a break from the crowds and taking a birds-eye view of the convention floor. 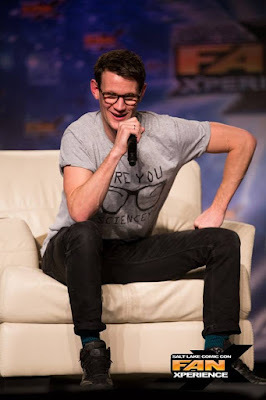 The big panel for Friday was The Doctor Who Experience featuring Matt Smith, Karen Gillan, and Billie Piper! Whovian's united for some timey-wimey fun with the Eleventh Doctor and two companions. 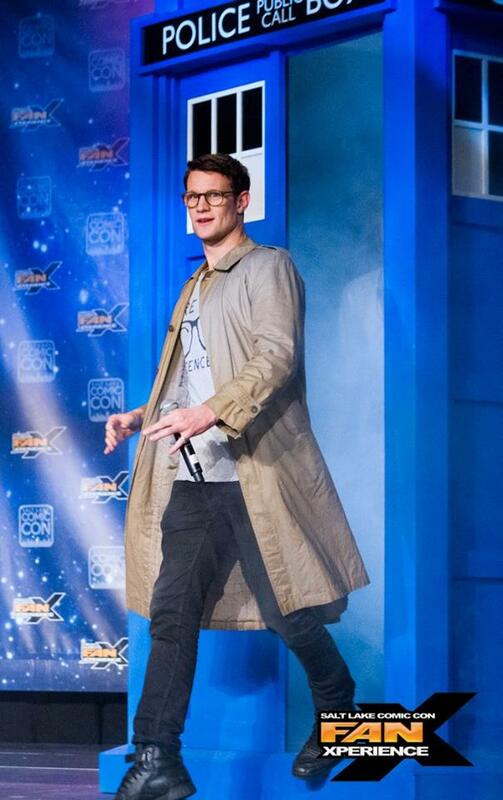 Matt Smith emerges from The Tardis. Matt Smith, Karen Gillan, and Billie Piper during the Doctor Who Experience. Our Saturday started off with a bang hitting the spotlight panel for the great Carrie Fisher, moderated by Bryan Young from Big Shiny Robot! While the panel was shorter than most panels, it was still a lot of fun. Carrie Fisher takes the stage in Salt Lake City. We stayed in the main Ballroom for most of the morning to enjoy panels for 'Game of Thrones' as well as 'The Vampire Diaries'. Following the Game of Thrones Panel, Paul Wesley and Phoebe Tonkin from 'The Vampire Diaries' took the stage. Their panel was a lot of fun as Paul was currently filming the show and had just Directed a new episode. Following the Ballroom panels I had my last two panels to attend. The first of the day was once again 'The Muppets'! We had quite a surprise on this panel as Kirk Thatcher joined us on the panel! Kirk was one of this year's special guests who has worked on so many great Muppet projects working directly alongside the late Jim Henson. Kirk also has worked on Star Wars! It was such an honor to be on the same panel as him talking Muppets. Can you tell we're in awe of Kirk Thatcher? Directly after the Muppets panel was a new panel that was suggested to me by a disabled actor, Josh Twelves. I absolutely love Josh and he always makes me laugh, so it was an honor to do this panel. The panel was called "Disabilities in Pop Culture". I really didn't know how to approach this panel with such a broad topic. I felt that this was a topic that shouldn't be us preaching to the crowd, but more of a discussion with the crowd. Josh was so nervous about being on this panel, I kept reassuring him that he would be amazing and sure enough he was! About 15 minutes into our panel a member of security grabbed my attention to let me know they had a surprise for us as 'Breaking Bad' actor RJ Mitte joined us on the panel. As many fans know RJ actually has Cerebral Palsy as his character Walter Jr. also portrayed on 'Breaking Bad'. 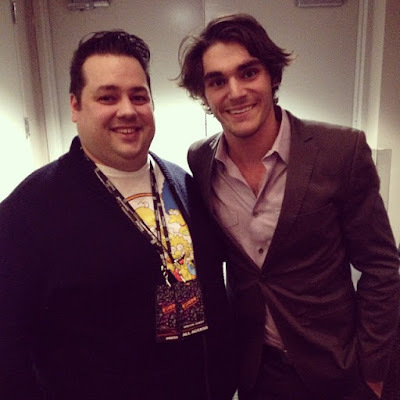 Sharing a laugh with RJ Mitte as he joined the panel. The crowd at the Disabilities in Pop Culture Panel. RJ's appearance really helped bring in the numbers for such an important topic. It was an absolute honor to have RJ Mitte on the panel. Talking with RJ after the panel he actually told me that he found out about the panel when he showed up for Comic Con and requested to have his spotlight panel cut short so he could join our panel since this was of course something very personal to him. That spoke so highly to me of who RJ is, and that even being in the Hollywood limelight, there are so many more important topics to RJ Mitte. 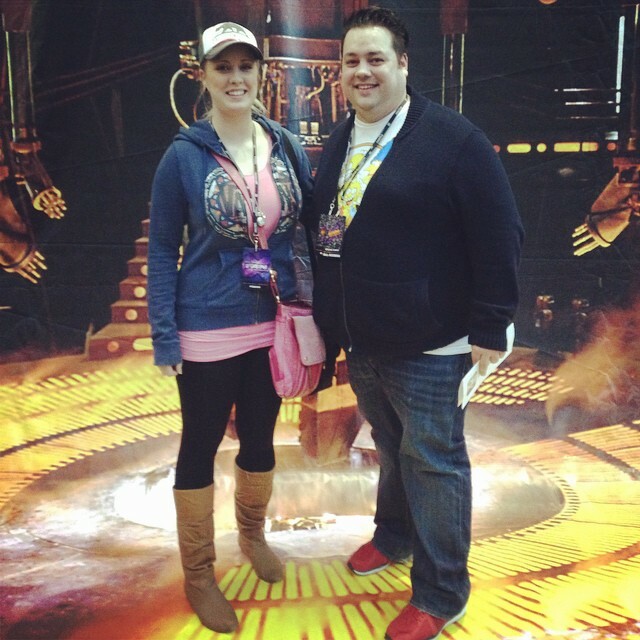 Salt Lake Comic Con FanX was such an amazing time! I am always so grateful to be a part of this show. The great people putting this together always go above and beyond to make sure that everybody involved and every fan has the time of their life. If you still haven't had a chance to experience Salt Lake Comic Con, make it a priority to attend this September! It will be an experience you will never forget. See you in September!